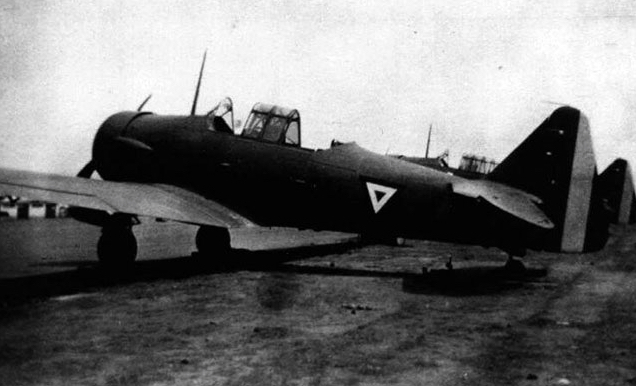 AT-6B – Same as AT-6A but with 600hp R-1340-AN-1 and dorsal gun fitted as standard, 400 built. Nevertheless, it’s important to keep in mind that this dramatic event occurred at a time when Mexico needed to strike back at the Axis powers, mainly to raise the morale in the home front, since the allies were suffering defeats elsewhere in the world. Also, one must remember that back then, factual information was really hard to obtain, mainly due to the security measures imposed. Thus, trying to confirm a submarine kill turned out to be almost impossible. Santa Lucia, Estado de Mexico. But first, let us analyze why Mexico decided to enter the war: By then, it was no secret that the Latin American country was disliked by the Axis Powers because its opposition to the Italian invasion to Ethiopia, its support for the Spanish Republican regime and most of all, for allowing the establishment of a Spanish government in exile in Mexico, which existed until after the death of General Franco. Other reasons for the animosity included the seizure, by the government of General Manuel Ávila Camacho, of 9 Italian and 3 German ships in Mexican ports. Ironically some of these ships, which had been incorporated into the Mexican Merchant Navy, were later sunk by the German U-boats. After the attack on Pearl Harbor, Mexico and many of the Latin American countries broke diplomatic relations with Germany, Italy and Japan. This political move raised the threat of a Japanese invasion of the U.S. and Mexican West coasts, including the Baja California peninsula. Thus, the Mexican government decided to deploy FAM aircraft to the region, which immediately began flying coastal defense missions. At the time, the FAM was comprised of two air regiments, each having 3 squadrons equipped with general-purpose biplanes such as the Vought V-99 Corsair, a handful of Vought O2U-2M, some locally-built O2U-4A Corsario Azcarate, and a few Consolidated Model 21-Ms. Of the two regiments, the 1st was ordered to deploy to Baja California, while the second stayed at Mexico City for providing cover to the country’s capital. Within days of the deployment, the first submarine alerts occurred: A Corsario Azcarate flown by Lt. Leopoldo Meza discovered and attacked with his machine-guns what seemed to be a Japanese submarine, about 30 miles from the coast of Sinaloa. However, it all indicated that the submarine was able to escape unharmed. Then, on May 13, 1942, the Mexican tanker “Potrero de Llano” was sunk by the German submarine U-564 near Miami, killing 14 of its sailors. Seven days later it was the ship “Faja de Oro” -one of the confiscated Italian tankers- that was sunk in the waters between the U.S. and Cuba, by the German submarine U-106. At San Antonio, Noriega and his pilots completed a two-week familiarization course with the AT-6s and set off for Mexico City on June 13. Along the flight, they made technical stops at Laredo, Plaza Monterrey, Nuevo León, Tampico and reached the country’s capital during the afternoon on June 14. 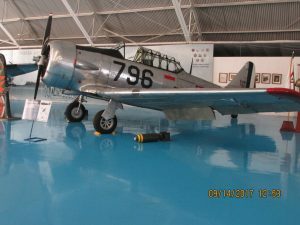 Despite being trainers, the AT-6s arrived with machine-guns and bomb racks installed, allowing the planes to carry either five Type M-5 30-pound or 20-pound incendiary bombs. Additionally, the planes had two auxiliary bomb shackles capable of carrying a total of 4 Mk1 100-pound bombs. However, based on photographic evidence, it’s safe to state that the common ordnance carried by these planes was in fact, a pair of Type M-30 100-pound demolition bombs, one under each wing. 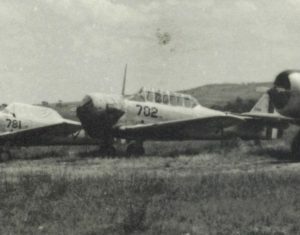 As for firepower, the Mexican AT-6s arrived carrying 3 Type M-2 .30 cal machine-guns, one of them mounted over the nose, synchronized to fire through the propeller, a second one mounted on the right outer wing panel and the third one on a flexible mount in the rear cockpit. Last, but not least, the planes were equipped with N-3B optical sights. 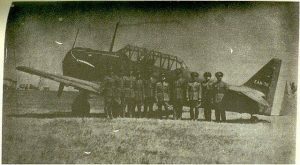 Five days after their arrival, the AT-6s conducted a dive-bombing demonstration near Mexico City, with the attendance of none other than President Ávila Camacho and other high ranking Army officers. Then, the crews set to finish their training and on July 4, a flight of the AT-6 squadron was ordered to establish a forward operational base at Tuxpan, in Veracruz. This flight was composed by three aircraft (P-77, P-78 and P-80), and the assigned crew included Maj. Noriega, Capt. Mena Barona, Lt. Gandarilla and the mechanics Fernando Lozario and Aurelio Becerra. On June 26, the German submarine U-129, under the command of Kapitanleutnant Hans Witt, torpedoed and sank the Mexican tanker “Tuxpan”, killing four of its crew members. Then, the next day, this same submarine sunk another Mexican ship named “Las Choapas” with the loss of 3 of its sailors. In both cases, the attacks were carried out less than 40 miles off the Mexican coast. As it couldn’t have been otherwise, the three AT-6s based at Tuxpan were sent immediately to locate the submarine and, if possible, search for more survivors of the sunken ships. 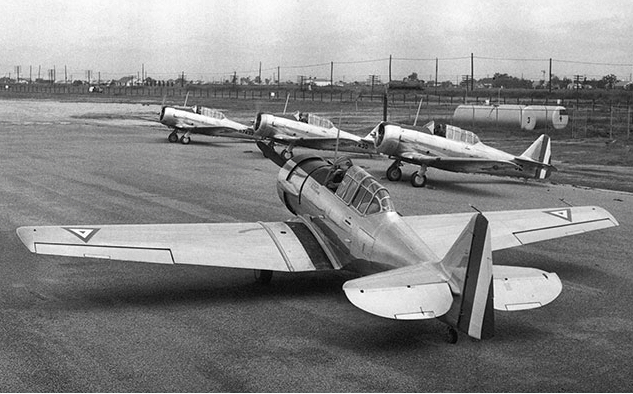 North American AT-6B EAN-702 the lowest number AT-6 that served in the Mexican AF since 1942. I believe this to be a AT-6B model, that after its used in the tactical units, it was sent to the Military Aviation school.